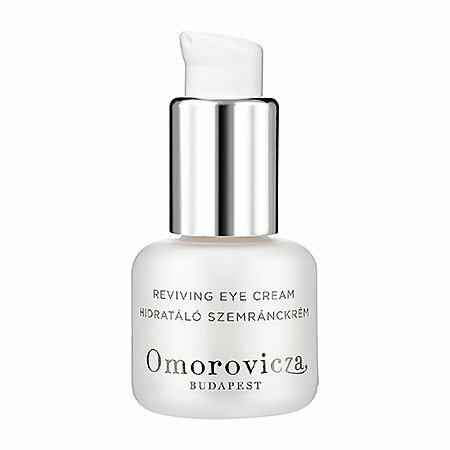 The Reviving Eye Cream from Omorovicza is at the ready when stress, fatigue and environmental factors take their toll on the delicate eye area. This specially formulated cream helps plump and firm eye contour, while refreshing tired eyes, reducing puffiness and eliminating dark circles. Essential Elements: Vitamin K, from lucernoil, is a great anti-coagulant that diminishes dark circles, and arnica reduces puffiness. Cucumber extract soothes and refreshes the eye contour, while hazelnut peptide firms and plumps, minimizing the appearance of fine lines and wrinkles. Mineral CosmetologyTM, a patented mineral delivery system, leaves skin firmer, more supple and younger-looking. For Best Effect: After cleansing, gently dab along eye socket using the tip of the ring finger. Avoid skin close to the eyes.